"Sherrie Lynn Damon, Westbrook College, Class of 1978"
Westbrook College student Sherrie Lynn Damon, Class of 1978, was a Legal Secretary major and lived in Goddard Hall. For her senior class candid photo, which appeared in the 1978 Tower Yearbook, she wore dark slacks and a Fair Isle yoke cardigan sweater. Her hair was shoulder length, parted in the middle and pulled back behind her ears. 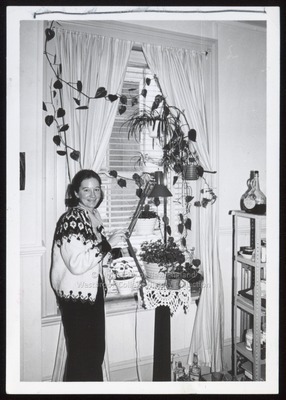 Sherrie stands at the window in her dormitory room and adjusts the lamp light which shines on an array of potted plants.